Black Krim tomato is a famous heirloom tomato with large, brown fruits that have green shoulders. The flavor is mildly tangy and salty. Production is excellent. 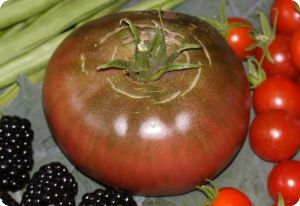 Tomato 'Black Krim' comes from the Crimea region of the Black Sea. This is one tomato that everyone must try sometime in their tomato-growing experience. The unique flavor is unforgettable and delicious.